Organizations around the world are turning to the cloud for secure, convenient ways to store and share information. In fact, in a recent survey of cloud users, about two-thirds of respondents reported that using the cloud reduced IT costs, freed up IT staff for more strategic tasks, and improved disaster recovery and business agility. Access to reliable cloud services is essential. 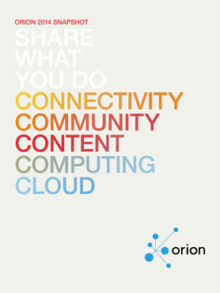 ORION’s Nebula program responds to this need, providing vetted cloud-based solutions for affordable prices. That’s just what happened when it connected educational organization Compass for Success to cloud services provider, Stage2Data. Compass for Success has a simple goal: “We want to increase graduation rates and engagement for all students in Ontario,” says Diane Findlay, manager of Compass for Success. But achieving that goal requires some complicated work behind the scenes, including gathering reams of student data—everything from attendance records to test results—and creating a business intelligence system to analyze and present the data in a way that is meaningful to educators. Compass for Success began as a partnership between nine school boards across Ontario. “We wanted to ensure every department within the organization, from the classroom to the boardroom, is making decisions based on evidence,” says Findlay. Today the organization is helping almost 40 school boards across the province analyze data and improve student outcomes. As interest grew, it became obvious “some school boards did not have the infrastructure, staffing or resources to support the required enterprise data warehouse system,” says Findlay. So Compass for Success enlisted the help of ORION, which linked them with Stage2Data, a partner in ORION’s Nebula program for cloud services. Stage2Data specializes in providing cloud-based data hosting, backup and disaster-recovery solutions. Now, more than half of the school boards working with Compass for Success do so via the cloud; many of them using ORION’s network to make it fast and simple. Teachers and administrators can use Compass for Success to produce detailed, interactive reports that illustrate the achievements—and challenges—of a student, school or school board. “Over the last seven years, we have used Compass for Success to provide teachers with a comprehensive class profile before each school year begins,” says Shelley Hudson, information and innovation services supervisor for Greater Essex County District School Board. “The profiles help teachers identify their students’ strengths and weaknesses right away, which means they can focus their pedagogical efforts appropriately.” For example, a teacher whose class struggles with reading comprehension might choose to incorporate more word problems into their math classes. Access to clear, consistent student data helps teachers be more effective in the classroom. The cloud provides flexible, affordable access at any time and on any device, and Stage2Data’s backups, archiving and disaster recovery mean the data will never be lost or unavailable. And the results? Hudson points to increased high school graduation rates—304 “bonus” graduates over the last four years—achieved through their ability to track and appropriately support students. Of course, academic data is highly sensitive. “We need to ensure that the data is protected and secure and that we comply with privacy considerations,” says Findlay. In response to those needs, Stage2Data “worked closely with Compass for Success to develop a comprehensive data security and disaster-recovery strategy,” says Jeffrey Fretz, senior account manager at Stage2Data. And as Compass for Success continues to grow, they know that this cloud solution will scale. “ORION has the capacity to support our current and growing needs,” says Findlay. By collaborating with school boards via ORION’s high-speed network and Stage2Data’s cloud services, Compass for Success is achieving its goal of fostering student achievement. Read this story and others about those on the ORION network who are doing amazing things to further research, education and innovation in Ontario in our Annual Snapshot.